Impact summary….we really enjoyed the opportunities to make personal differences in the lives of the kids and community and participate in the efforts of the churches. We partnered with the Voice of God Church which serves the SOH Home and community and the Teso Church in Torroro. We saw several people come to accept Jesus as savior. Last Sunday during service, a woman stood up and the whole church exploded into screams and dancing with joy and excitement. The woman was a practicing witch whom the church has been praying for and had decided that Christ was her savior and to be born again. We also saw churches get excited about serving their communities, children being excited about school and their future, the community to see a practical example of the love of Jesus Christ, improved the health of the children and community, and for the children to feel less “Fatherless”. Thank you everyone for your prayers and support that made this possible. It was everyone that did this….we were the fortunate ones that got to witness it personally. I am actually in the long process of returning home. It was a good trip and we completed all of our target projects. We made a big impact on the home operationally and security wise. Here is an outline…. installed two additional batteries and new control panels in the main control room and in each building. installed new wiring and lights in all the rooms of the girls dorm. installed 7 motion sensing security lights around the compound. installed lights in the latrines and bath houses. built roosts in the new chicken coop. installed a new hose system to transfer water to storage tanks. cemented the areas between buildings and created rain water removal ditches all to reduce mud. installed gutters and two storage tank space on the girls dorm to collect rainwater. instaled a hood and electric fan over the cookers in the kitchen. installed 3 cyclone vents in the roof above the kitchen and dining hall to remove heat and smoke. installed new and additional lights in the kitchen. built furniture for the guard shack. I’m forgetting a dozen smaller projects. We were busy and enjoyed the instant gratification of the improvements being gratefully used. Praising God for all. Thank you all for your support and prayers for us. We just completed the 2nd month of construction on the new Girls Dorm at Stream of Hope Home in Uganda with good progress made. It is under roof now. Window and door fitting and the plastering of the walls inside and out is commencing. After plastering the walls, ceiling, and floors, painting is all that will be left to finish by the contractor. We should see the building finished within the next 4 to 6 weeks. 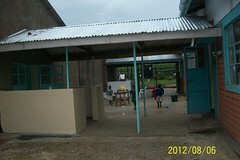 The girls will be moved in then during our next trip in January, we will install lights and gutters. We started this project in faith and need and without full funding. The total cost of the building is a very economical $50,000. If you are led to be part of this project please contact us at bob@missionservants.org. Here are a few photos of what happened in month two…. Summary of the trip accomplishments….We got a number of projects and upgrades completed even though our team was 2 and a lot was happening plus a lot of minor repairs. The kids were out of school all week and enjoyed our attention. Thank you for your prayers and support. Here are some…. Drinking water storage tank for the community. 3 additional solar panels and newsstands, wiring, and inverters eliminating power shortages. Concrete floor for the shelter. It has been an emotional week at Stream of Hope Home. Diana leaving us has been the hardest. She was just 15 and a sister to these kids. We had a beautiful celebration for her with the community and God was praised. She was buried at her Grandfathers home about 1/2 km from the orphanage. The celebration involved about 400 people, guest speakers, butchered cow and tons of food. Interesting is that the custom is for people to stay with the family so the night before and after saw over 100 people sleeping all over the grounds with a big bonfire. We will miss her but the kids and I look forward to seeing Diana again.